If we use an example of a typical hospital facility with 500 beds, it would have approximately 5,000 hand sanitizing liquid dispensers mounted to the walls, on average. While building facilities are meant to last 30+ years, dispenser contracts are typically for three to five years. Change-over at end of a contract entails removal and replacement of the dispensers by the winning contract which is often in our experience hastily done. 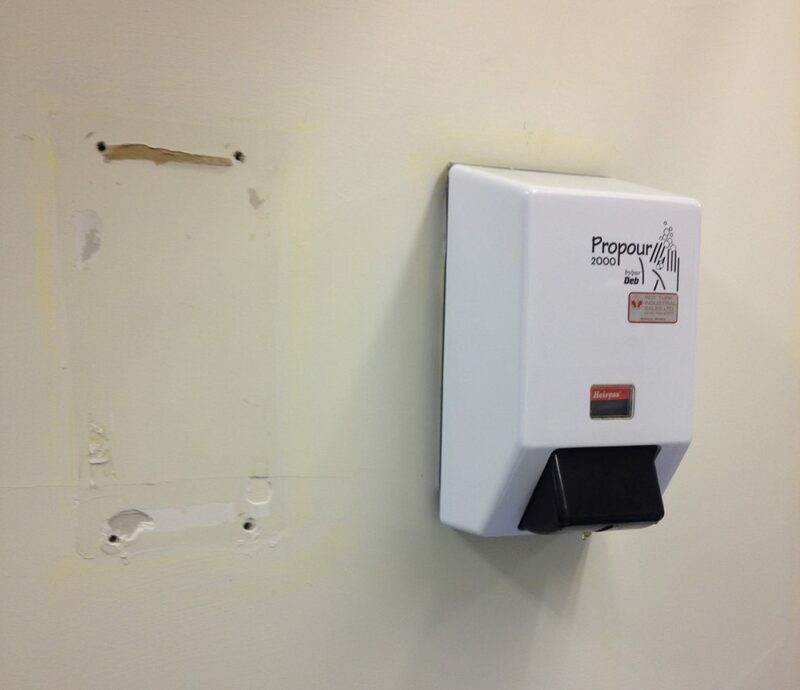 Even though the original location was ideal, the new dispensers can’t simply be re-mounted where the old ones were because the holes left in the drywall weaken it and prevent anything from being re-mounted there unless great expense, care and time is taken bringing the drywall back to its original state. This prevents the mounting location from being used more than once, which affects ergonomics, accessibility and the overall aesthetics of the space as the dispensers “travel” across the wall over the years. These unnecessary costs are likely even greater than you think. Tagg Clean-Hands® Compact Wall Sanitizing Stations address these issues and save enough in general maintenance costs to more than pay for itself over a typical facility life cycle. 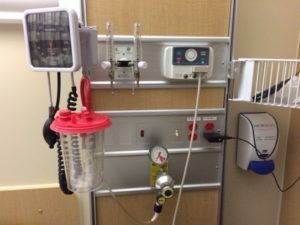 With hospitals continuing to experience increasing maintenance costs this becomes an important solution for saving these unnecessary expenditures. Lets look at the math. An average unionized maintenance person receives approximately $40,000 CAD per annum plus benefits which is about $25.00 per hour. Let’s assume that it would take a half hour to complete each drywall repair properly. This includes cutting new drywall, taping, mudding, sanding, priming and painting the patched area only – not the entire wall. Even the 5-year estimate is significantly more costly than outfitting each of the 5000 dispensers with our Compact Wall Stations. Due to the sensitive nature of the hospital setting these costs will likely be even greater on account of working around patients. It gets even more complicated when infection control is concerned. This math only covers wall repairs due to change-over. Dispensers drip, which means either installing drip catches (often costing several dollars more per “free” dispenser for something that’s flimsy, hard to clean and frequently goes missing) or putting up with further floor and wall damage and related repairs. As well, older buildings often use materials containing asbestos, increasing the costs and dangers of wall and floor damage. Our Tagg Clean-Hands® Compact Wall Stations are engineered and built from superior surgical-grade stainless steel to support the life cycle of any facility, eliminating these unnecessary repairs and related costs from being needed because once their wall bracket is installed it can be there permanently at its ideal, ergonomic placement. There’s no damage to walls at the end of liquid contracts – simply attach any brand of new dispenser to our station. It securely locks to the bracket for safety, but can be easily unlocked and lifted off to allow efficient painting of the wall behind when needed, saving even more unnecessary maintenance labour costs. It’s quick and easy to assemble and install and has by far the sturdiest drip catch you’ve ever seen. Over all, they are designed to be functional, visually appealing, sustainable and effective. This is because every dollar saved in unnecessary facility repairs is a dollar that can be better used elsewhere. Given the state of health budgets we need all the efficiency we can get. * While our example assumes an annual salary of $40,000, in real terms this number will only increase over the life cycle of the building substantially increasing the savings. 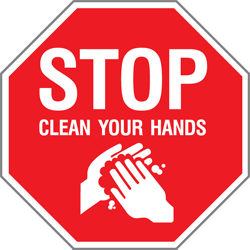 ‹ Can Hand Hygiene Afford to Make Money? Great article. I never thought of the costs.